Steelcase and Microsoft Corp. have joined forces to explore the future of work, developing a range of technology-enabled spaces designed to help organizations foster creative thinking and better collaboration. These spaces seamlessly integrate the best of Microsoft Surface devices with Steelcase architecture and furniture. Today the companies unveiled five new “Creative Spaces” showcasing how Steelcase and Microsoft can help organizations unlock creativity for every employee. That Microsoft is expanding its partner network into the world of design by bringing in select Steelcase dealers as authorized Surface Hub resellers. Steelcase and Microsoft are working together to develop technology-enabled workplace solutions built on Microsoft Azure IoT technology. According to joint research conducted by Steelcase and Microsoft, creativity is seen as a critical job skill driven by organizations’ need for innovation and growth in addition to employees’ desire for meaningful work. However, today many organizations invest in technology and space as separate entities rather than approaching them holistically. The lack of cohesion creates sub-optimal conditions for fostering creativity at work. Seventy-two percent of workers from diverse fields including Health Care, Retail, Education, Financial Services and Manufacturing believe their future success depends on their ability to be creative. Seventy-six percent believe emerging technologies will change their jobs, requiring more creative skills as routine work becomes automated. There is greater need to collaborate in business, yet only 25 percent of respondents feel they can be creative in the places they currently have available for group work. The study also reveals the connection between creativity and privacy, as employees ranked having a place to work without disruption as the second highest factor that could improve creativity, just behind the need for more time to think. The companies’ exploration of creative work found that creativity is a process in which anyone can engage and requires diverse work modes as well as different types of technology. People need to work alone, in pairs and in different size groups throughout a creative process, and they need a range of devices that are mobile and integrated into the physical workplace. Additionally, spaces should inspire people without compromising performance. Focus Studio: Individual creative work requires alone time to focus and get into flow, while also allowing quick shifts to two-person collaboration. This is a place to let ideas incubate before sharing them with a large group, perfect for focused work with Microsoft Surface Book or Surface Pro 4. Duo Studio: Working in pairs is an essential behavior of creativity. This space enables two people to co-create shoulder-to-shoulder, while also supporting individual work with Microsoft Surface Studio. It includes a lounge area to invite others in for a quick creative review with Surface Hub or to put your feet up and get away without going away. Ideation Hub: A high-tech destination that encourages active participation and equal opportunity to contribute as people co-create, refine and share ideas with co-located or distributed teammates on Microsoft Surface Hub. Maker Commons: Socializing ideas and rapid prototyping are essential parts of creativity. This space is designed to encourage quick switching between conversation, experimentation and concentration, ideal for a mix of Surface devices, such as Surface Hub and Surface Book. Respite Room: Creative work requires many brain states, including the need to balance active group work with solitude and individual think time. This truly private room allows relaxed postures to support diffused attention. “We are facing a time of unprecedented change at work. Through this partnership we will bring together space and technology to help workers and organizations solve the workplace challenges they face today and in the future and ultimately perform their best at work,” explains Armbruster. 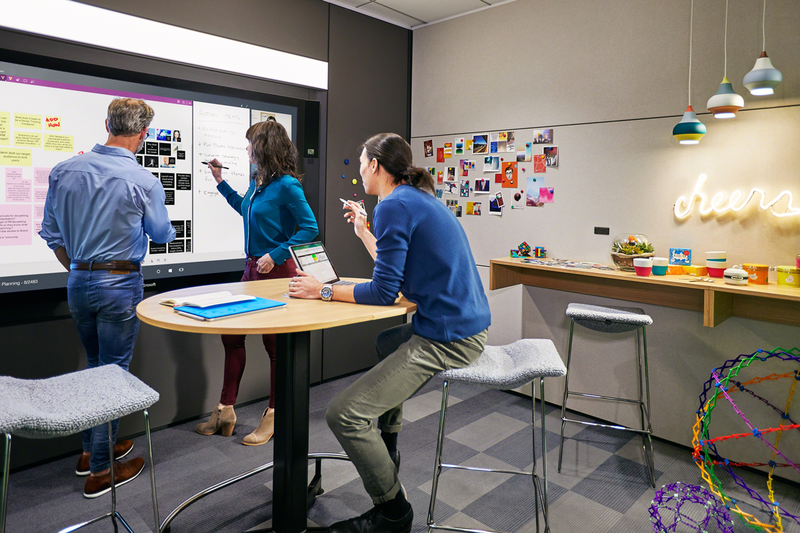 Select Steelcase dealers are authorized to resell Microsoft Surface Hub as a part of the Microsoft partner network beginning today in the United States and Canada, and in later Summer 2017 additional dealers in Germany and the United Kingdom are expected to be added to the program. The companies will announce additional markets in the coming months. As the spaces roll out in the Americas, Europe and Asia Pacific, the range of spaces will continue to expand and evolve. In the coming months, Steelcase expects to announce new technology-enabled office solutions built on Microsoft Azure IoT technology, which will provide companies with analytics that help improve workplaces and solutions to help employees find the best places to do diverse types of work within the office. For more information on Creative Spaces and the partnership between Microsoft and Steelcase, visit www.steelcase.com/creativity or www.microsoft.com/en-us/devices/business/steelcase.